Today we’ll spend a day with the people of Isfahan, ‘the city that is half the world’, and the one where we found the Iran we dreamed of. The morning had the hazy stillness of winter. 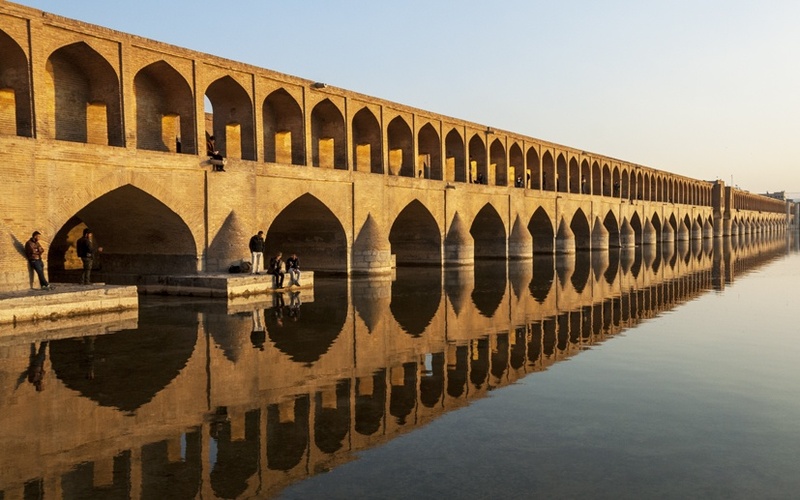 It wasn’t cold – even though temperatures often plummet below zero in winter, that day in Isfahan was warm. I pulled my hijab back and pinned it on top of my ponytail, as I had seen Iranian girls do. 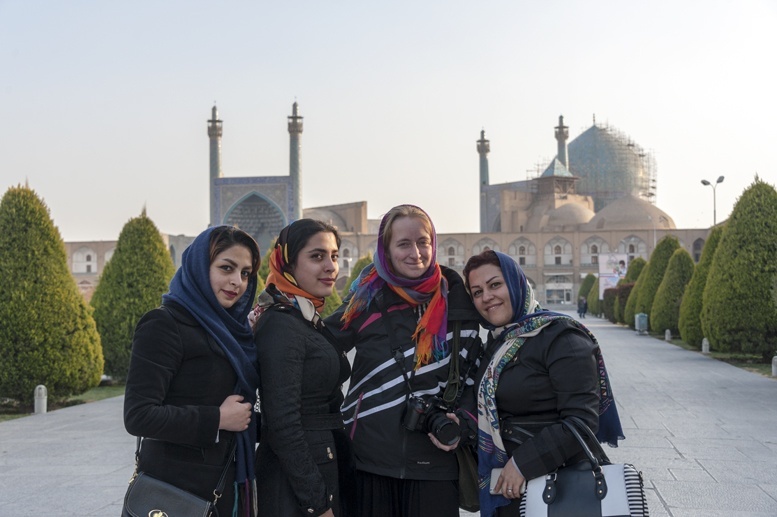 I followed their eyes as we walked through Isfahan on our way to Naqsh-e-Jahan square – those darting, daring, penetrating eyes, some pale blue some deep black, some without make-up, others lined with kohl. I had wondered about Iranian women. I wondered if they were subdued, victims of their husbands and fathers, and a male-dominated society that reminded them at all times that ‘Islamic dress code must be respected at all times’. Same as I had wondered about the country. People thought we were crazy when we announced we had decided to visit Iran. ‘It’s dangerous, it’s full of terrorists’ were some of the reactions we got. 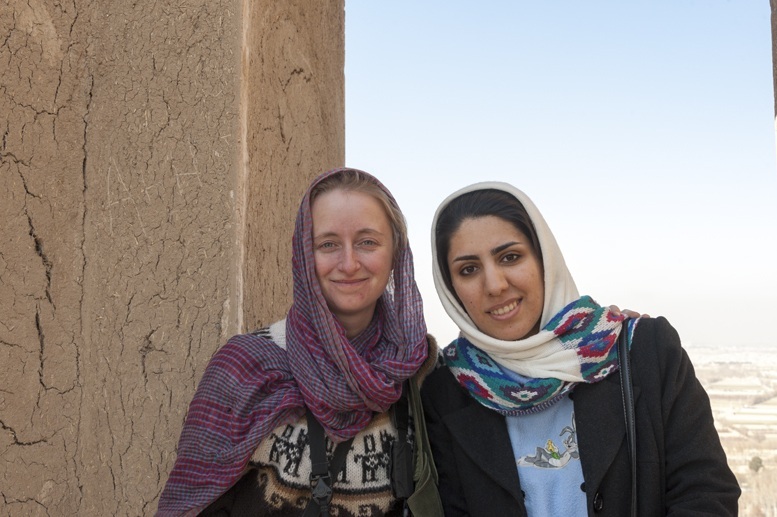 Iran is not a hotbed of terrorists – Iranians are the friendliest people on the planet. Iranian women are not repressed – they are fierce, independent and beautiful. Iranians don’t hate the west – their government might have, at some point, but you should all know better than judge a book by its cover. 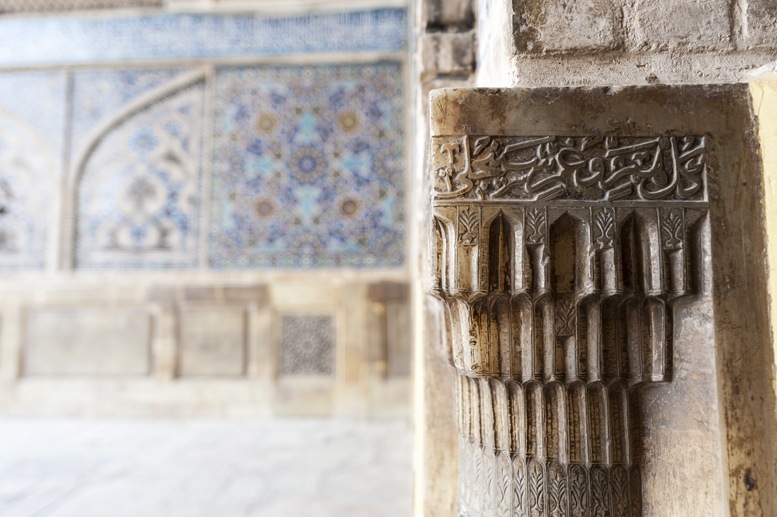 These are just some of the prejudices that were smashed during our visit to Iran – specifically, when we visited Isfahan. Tehran left us underwhelmed. It’s still worth a visit, we thought, but we didn’t fall in love. In Isfahan, we did. We fell in love with the skyline of domes and minarets, with the huge Jameh Mosque, lost in the maze of streets of the historic centre. We fell in love with the bazaar, where enamelled cups, printed fabrics and carpets are piled in the back of dusty shops, and you know where you enter but not when you’ll leave, as you feel as if you were caught in a maze, with shop after seller after shop after seller inviting you in for a cup of tea, while sunlight from streams lazily from the skylights on the ceiling. 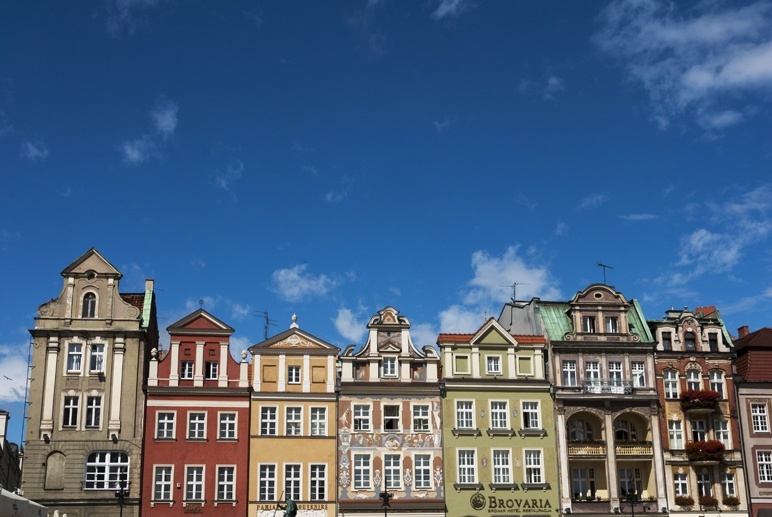 The city is nicknamed ‘Half of all the world’, because of its grandiose sights and unrivalled beauty. 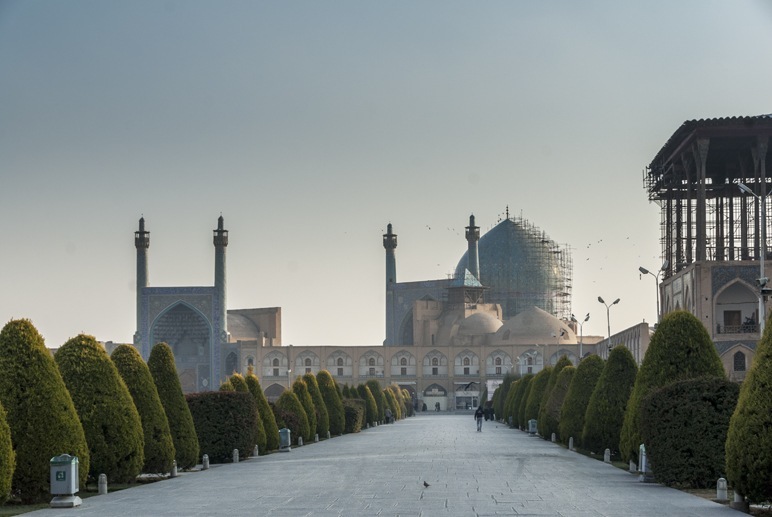 When we entered Naqsh-e-Jahan Square, our hearts skipped a beat. Sometimes, we experience a degree of beauty that is just too much for our little human selves. It makes us feel transient and pointless, yet elevates us – in this case, because such beauty was made by humans like us. Naqsh-e-Jahan translates as ‘image of the world’. 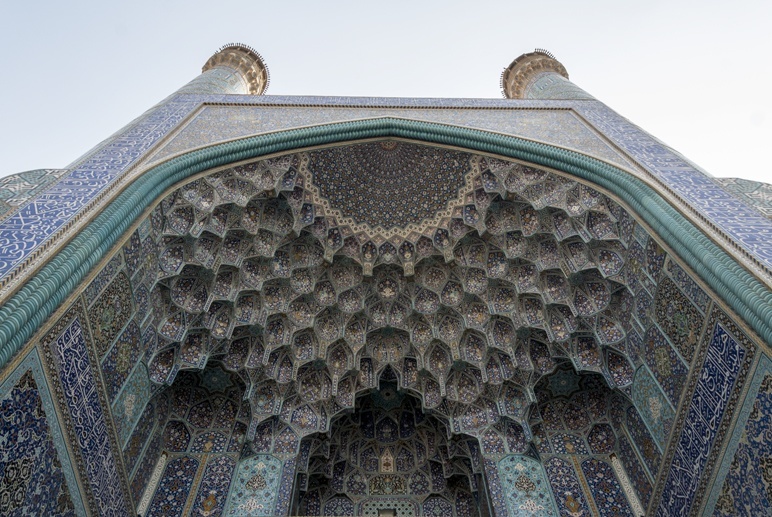 It’s perhaps one of the most exquisite collections of Islamic architecture of all times. 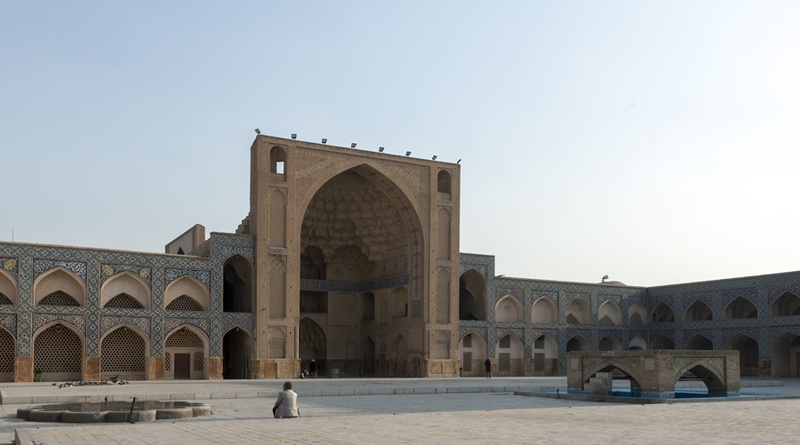 We entered from the western side, right next to Ali Qapu Palace, with a balcony from where the Safavid rulers of Persia watched the show, as the whole square was sanded over and turned into a polo court. Right opposite us was Sheikh Lotfollah Mosque, the court’s private mosque, with its tiled entrance portal and dome – and its golden interior. 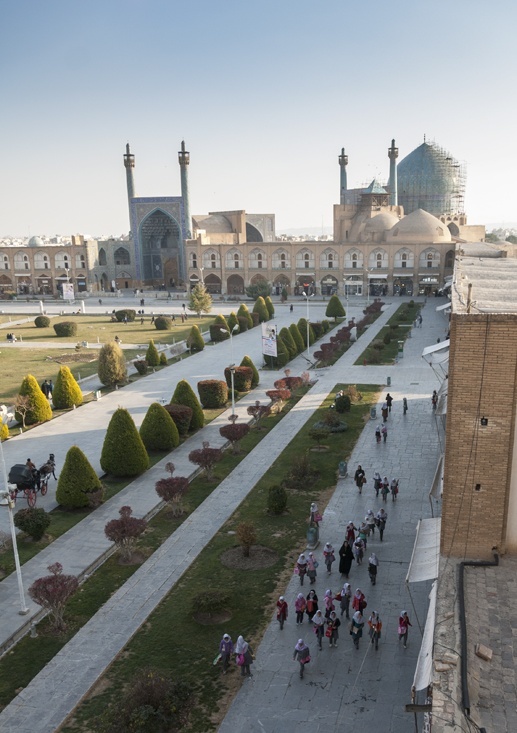 The southern side of the square was dominated by the huge dome of the Shah Mosque, and the northern side was the entrance to the timeless mysteries of the bazaar. In the centre of the square, fountains tinkled and horsemen sat in their carriages waiting for tourists. 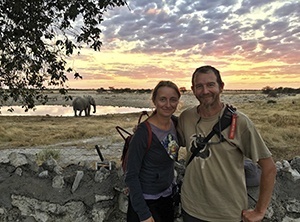 We only saw a handful of other westerners – curious souls such as ourselves, keen to learn the truth about this misunderstood country. In Isfahan, we were never alone. Not while sitting in Naqsh e Jahan square, trying to capture on camera the way the light shone on the dome of the Imam Mosque. People came up to us – men, women and children, sellers keen to invite us in their shop for a cup of tea, groups of young ladies wanting to have their picture taken with me. And dozens, dozens of people wanting to know about us. What we did, why we decided to come to Iran. And then usually came the most difficult answer of all – what do people think about Iran in your country? I was ashamed to answer with the truth, yet I was unwilling to lie. So my answer usually was ‘whatever they say, we know it’s not true’. Don Camillo was one of the people we met in the square – he called himself ‘Don Camillo’ for his resemblance to the protagonist of a series of 1950’s Italian films. He had big friendly eyes and a contagious smile. I had no intention to shop and usually refused offers to enter stores – but Don Camillo was somewhat different. He exuded kindness and honesty. We followed him to the back of an alleyway, where between stacked plastic chairs and construction tools was the entrance to his store. 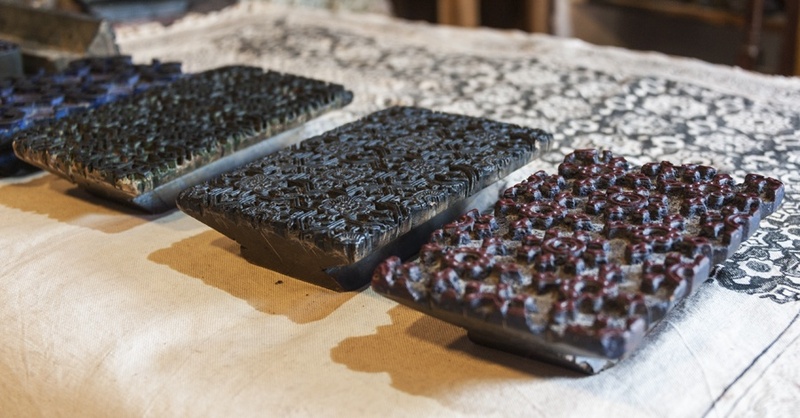 Don Camillo’s craft were printed tablecloths, made with natural dyes and wood carved stamps. We observed as he showed us some block stamps that had been in his family for generations, and then one of his relatives showed us how to mix water and natural pigments to make dye, before applying it on a cream-coloured tablecloth, decorating it with beautiful floral patterns. What next? We expected a hard sales pitch, but Don Camillo just greeted us with a smile and a warm handshake – sharing his craft with us was all he wanted. 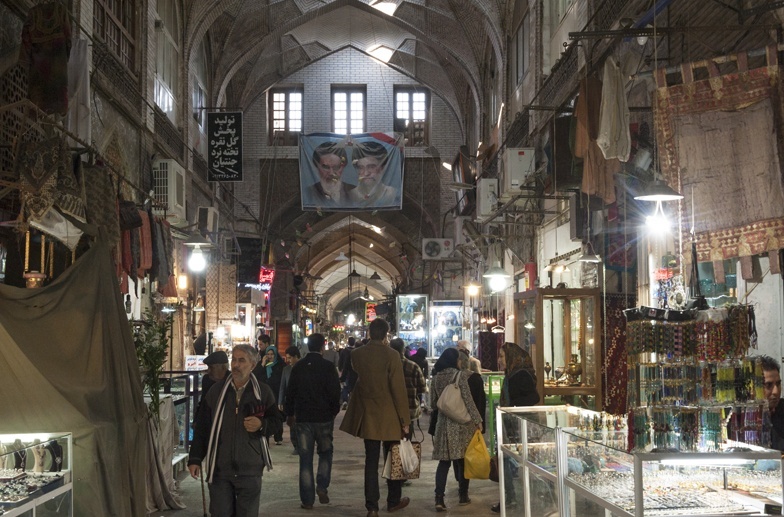 We wandered the bazaar until dusk, when the streams of light illuminating the bazaar got thinner and thinner and a brief winter sunset turned Naqsh-e-Jahan square into a dream. Long shadows criss-crossed the pavement, the steam was rising from street-food carts while the dome of Sheik Lotfollah Mosque became golden. And then the sun disappeared. Night fell fast, but life didn’t stop in the bazaar. A young man heard me speaking Italian and came to tell us (in flawless Italian) about his girlfriend in Florence, and how he’s going to move there when they’ll get married. 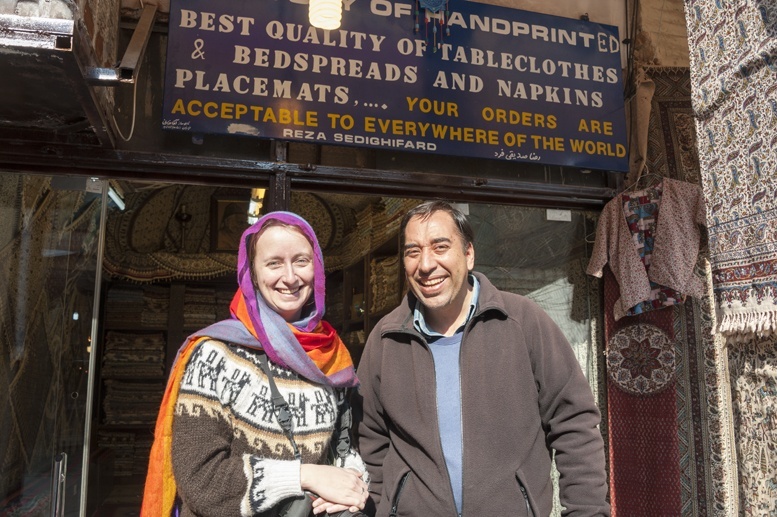 This is how we met Paisa, one of the owners of the Flying Carpet shop, located right next to the Imam Mosque. 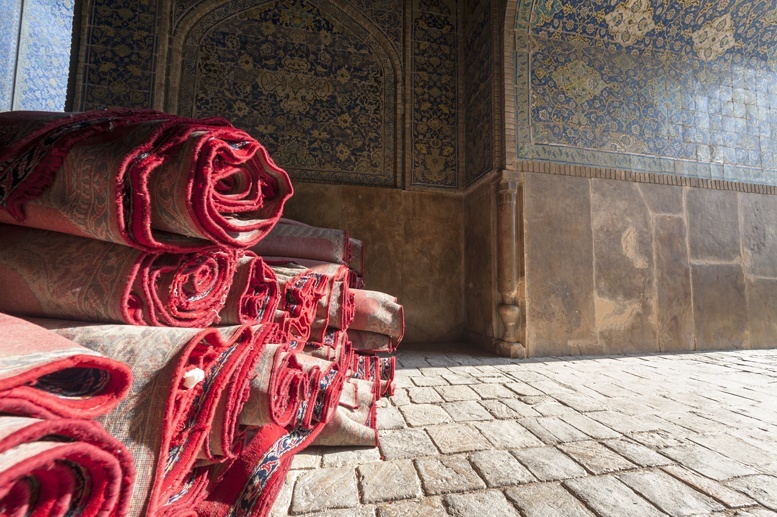 The store was tiny, piled to the roof with ancient kilims, praying rugs and one beautiful Persian carpet after the other. But we had told Paisa we couldn’t care less for carpets, so we followed him and his friends to Café Roozegar, in a tiny alleyway at the end of the bazaar. Inside, if it wasn’t for the cigarette smoke, and hijab on the head of every woman, we could have been anywhere. In Notting Hill, Prenzlauer Berg, or Budapest’s 7th district. It was one of those hipsterish, faux old-fashioned cafés, with mismatched furniture and faded wallpaper. A young man sketched a futuristic cityscape on his Moleskine. Friends chatted in front of coffee and huge slices of cake. Two men brushed hands and exchanged a glance. 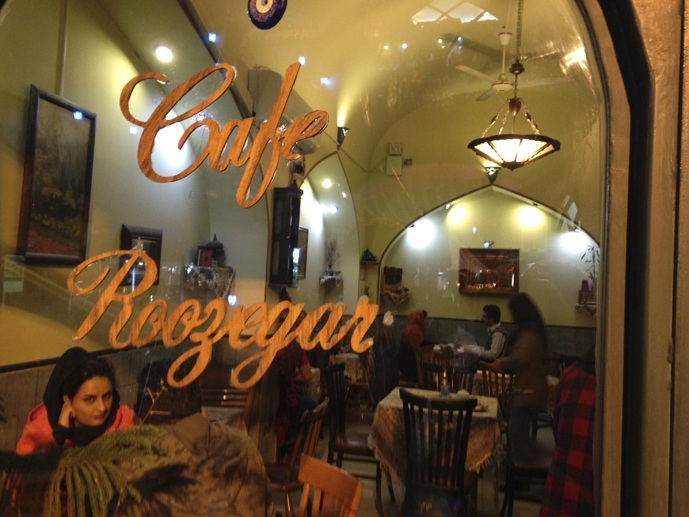 In Café Roozegar, we saw young people being young. 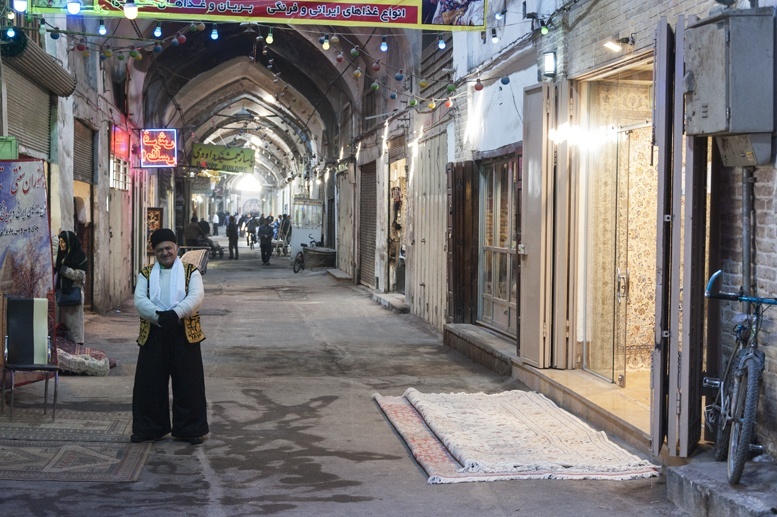 Yes, no alcohol is allowed in the country, and so socialisation takes place in cafés like Roozegar, or the cafés of the Armenian Quarter of Isfahan. Laughter is louder, the glances less elusive, hijabs are pulled further back. We chatted about music, movies and travel – plans for us, dreams for them. 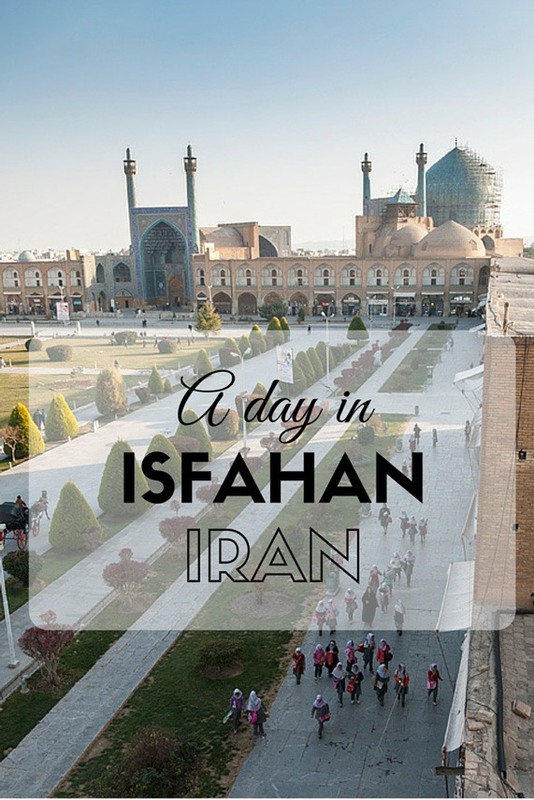 We ended up spending 5 days in Isfahan – quite a long time, considering we only had a two week visa. Every day, we met new people – a walk across the famous Siosepol bridge took about 20 minutes, as people stopped us to chat and invite us to their homes, then gave us their phone number and said ‘call me any time, if you need anything’. If we had an amazing experience in Isfahan it was mostly thanks to Meysam, our couch surfing host. At his place we got to know his mother and sister, and his fiancée (now wife!) Mahboobeh. 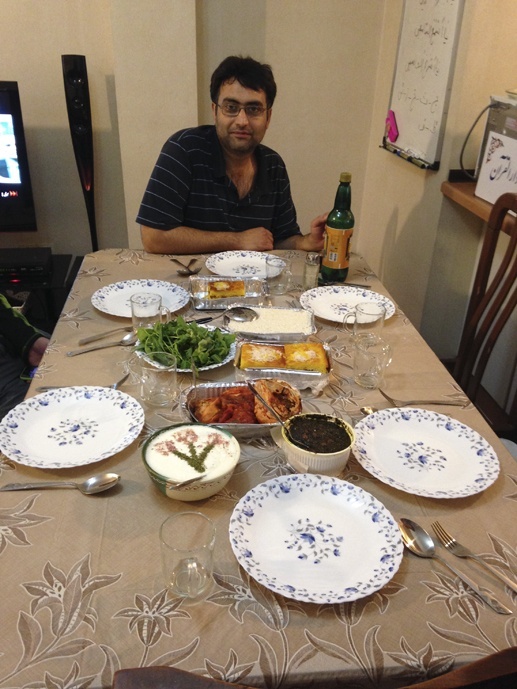 We spent the whole of New Year’s day cooking together, making some sort of hybrid Iranian-Italian food. Meysam is a photographer and filmmaker, and he showed us many of his photo essays and videos. He had just returned from Iraq – and there I gave him the same reaction as my parents when I told them I was visiting Iran. Is it safe? Meysam had visited Iraq on a walking pilgrimage, to visit the shrine of the Imam Hussain in Karbala, one of the holiest places for Shia Muslims. He filmed a short documentary, showing locals chasing pilgrims to offer them food, water and shelter. 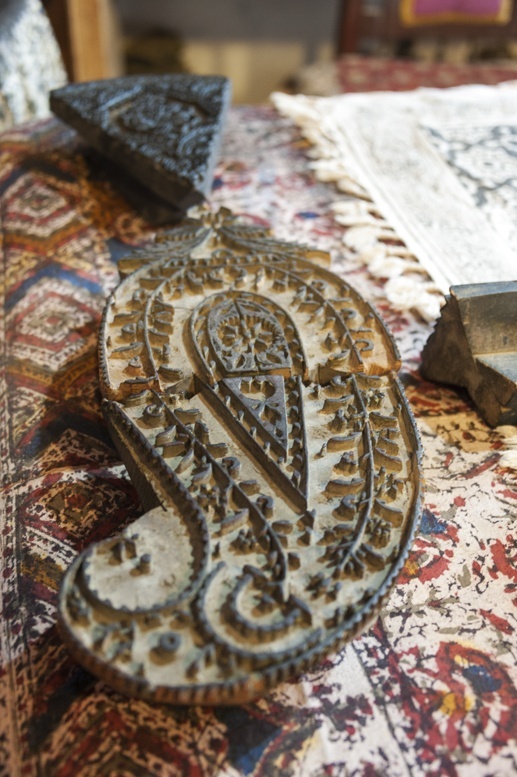 ‘Hospitality is in their blood, and guests – especially pilgrims – are sacred’, Meysam said. 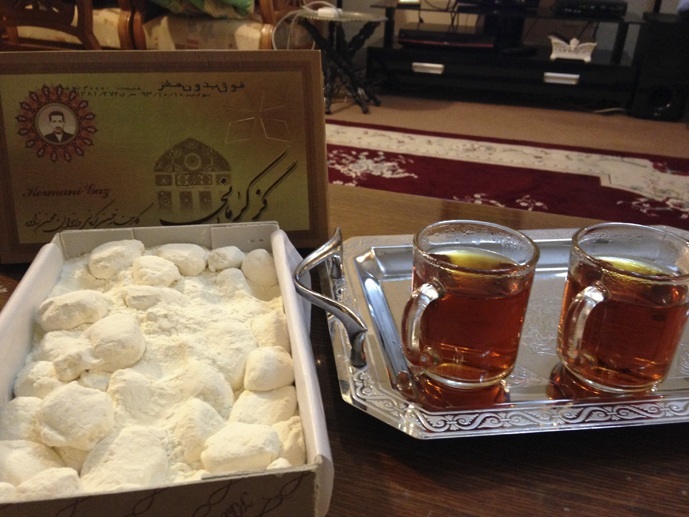 We spent New Year’s Eve with Meysam and Mahboobeh, and celebrated midnight with a cup of tea and some rosewater sweets. On New Year’s Day, they took us to Atashgah, Isfahan’s Zoroastrian Fire Temple. We climbed the rocky hill to the summit, and all of Isfahan lay before us. The view was messy and hazy – a shapeless city, stretching into the desert. 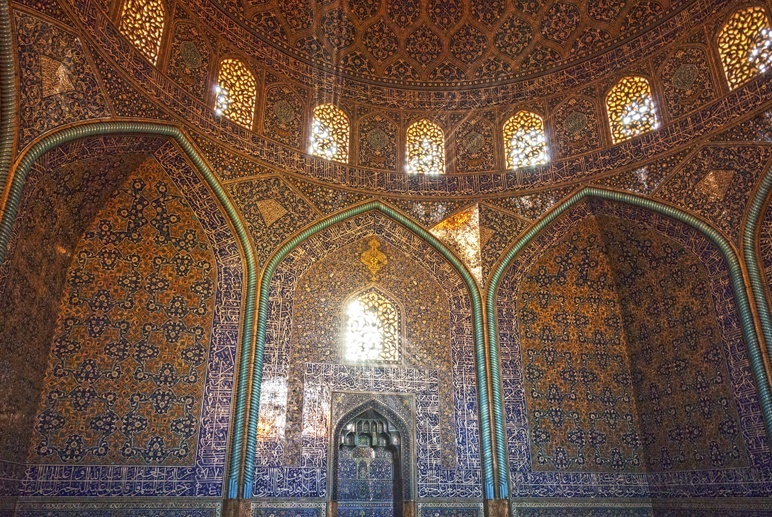 The following day, we left Isfahan, bound for Shiraz. Meysam and Mahboobeh asked us to stay a little longer. ‘You came as visitors, but you are friends now’. There are always talks of ‘educating’ the Middle East, and how Middle Eastern refugees need to ‘conform’ and ‘integrate’ when they come to the west. Let me tell you, we need to learn from them. We need to learn to open ourselves to strangers, we need to learn to make people welcome. An individual is nothing – a community is something. I have never felt so loved and welcomed in a country as I have whenever I travelled the Middle East – Jordan, Kurdistan and now Iran. After all, we are one people. This is the lesson I will carry in my heart, the gift from the people of Isfahan. What an incredible adventure to an area so few of us visit. 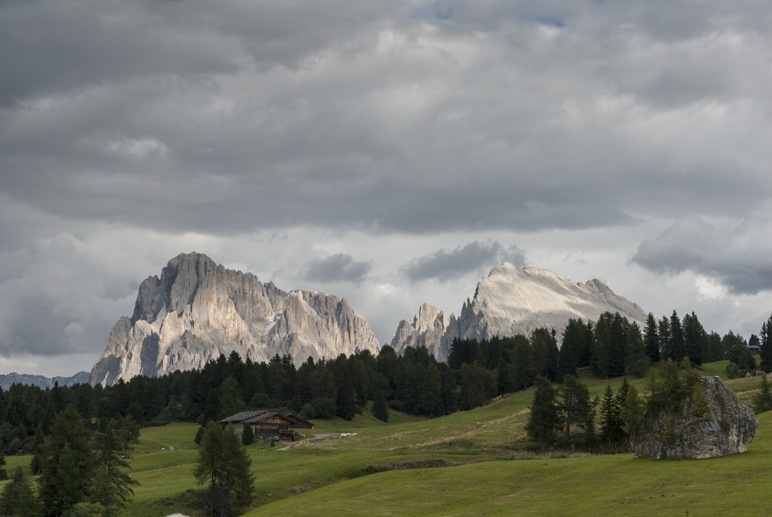 Your photos are stunning, your stories are welcoming. I know little of Iran, but I am sure I would be met with a similar reaction from my family if I suggested we were headed there. Not specifically because it is Iran, but I seem to be met those same questions if we go anywhere outside of the English speaking world, or western Europe. Thank you for sharing your positive experiences. I had a very different experience to you in Esfahan. In fact, it was the most unpleasant place that we travelled to in Iran. 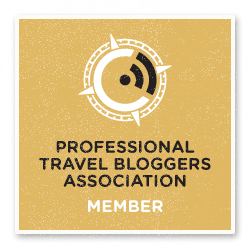 To us, it seemed that the people have been negatively impacted by tourism (domestic and foreign) and it was the only place in Iran where the people seemed untrustworthy and unfriendly. Our Iranian friend from Shiraz complained that even when he goes there, they will try to take advantage of him. Yazd and Shiraz are much more enjoyable experiences. 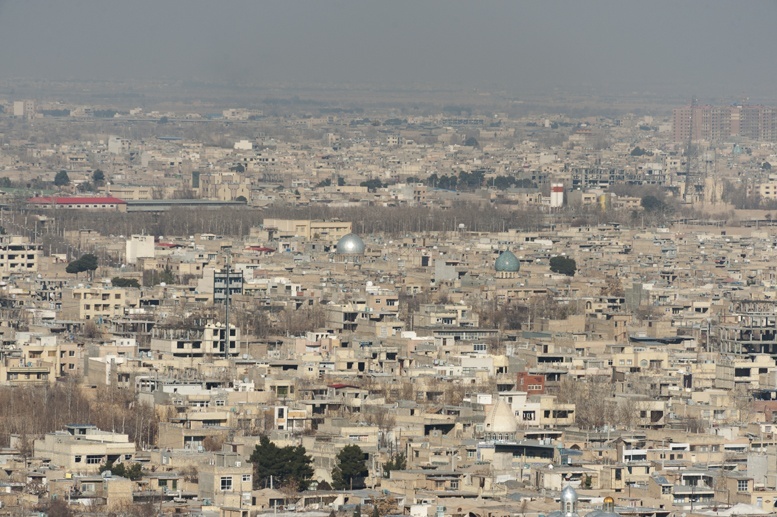 For us, the people of Esfahan ruin the city. What an inspiring article! Makes me want to go to Iran and experience this myself. Thanks for sharing this awesome perspective about the people and their lives. Thanks Jess! You should go, I’m sure you’ll love it. Magherita – I love your pieces on Iran, your feelings for the country are so infectious, I have tears in my eyes (I’m also a big crybaby who cries at just about every Hollywood movie)! I’m a journalist, about to go to Iran on my own in two weeks and I would love to be able to write something about Iran. Would you be able to link me up with Meysam if he would have some time to host me? I’m a 28-year-old female from Singapore. Thanks so much for your comment! I’ll send Meysam a message and email you back if he replies – hopefully he can show you around or even just give you some tips. 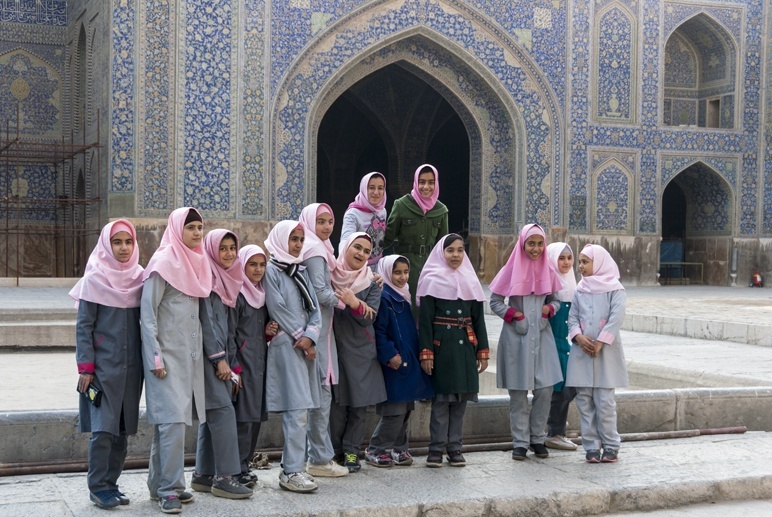 Otherwise fear not, Isfahan is the friendliest city in the world and you’ll make friends for sure!